Sensei Leung Pak-ki started his training of Shitoryu Karatedo in 1975. The training was suspended due to concentrated effort in his studying since 1978 and subsequently resumed in 1983. He obtained the Black Belt 1st Dan in 1984 and won the championship in kumite of the Hong Kong Karatedo National Tournament in the same year. In the 1st Hong Kong Karatedo Team Championships in 1991, Sensei Leung and his Shitoryu Karatedo team-mates won the championship in team kumite competition. In 2000, Sensei Leung obtained the Black Belt 4th Dan of the World Shitoryu Karatedo Federation in Tokyo, Japan. Sensei Leung was the first group of students who attended the coach training and became a qualified coach of the Hong Kong Amateur Karatedo Association. Also, he was a very experienced referee in karatedo competition and had taken part in numerous tournaments local and overseas, including the 3rd World Shitoryu Karatedo Championship in Japan, 2000. 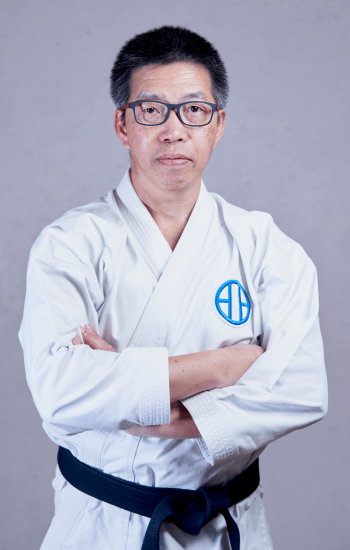 In 1985, Sensei Leung started his coaching life at the Hong Kong Girl Guides Karatedo Dojo.In 1998, he set up another dojo in Fung Yiu King Memorial Secondary School at Ma On Shan. During the years of coaching in Karatedo, Sensei Leung was deeply impressed by the positive change induced to a participant after taking part in Karatedo training where a naughty boy would become obedient and polite, and a shy boy would become confident and tough. Under the principle of “teaching everyone in dojo who is willing to stay”, no matter the talent and character of the student is, once he is in the dojo on his own wish, he will be treated and trained under a fair condition and be led to conquer the difficulties ahead in order to obtain the valuable prizes rather than Karatedo technique, such as health, discipline, politeness, tolerance, cool-mindness, confidence, etc. all to be accompanied with him forever.